Now we need to talk about “Action” windows in A:M and how they are different than “Modeling” windows. Then we will talk about why we’ll use an “Action” window to assist us when we begin to layout bones for a rig. 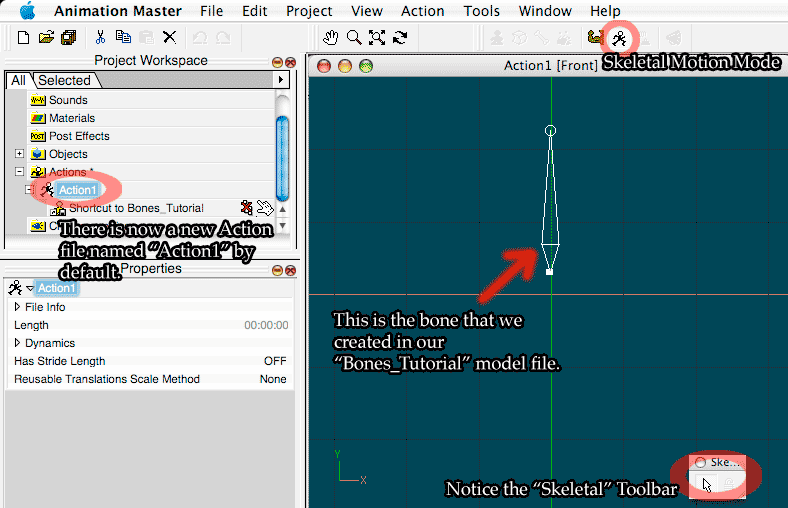 So far we have only been working in a “Modeling” window to learn about bones in this tutorial. Remember that a Modeling window is only used to create a model and the bones that go into it. For our purpose here in this tutorial, there is not much more that we can really do once we have positioned and laid out the bones in the way that we may want them. There is another kind of environment in A:M that we can use to check our bone layout and take our rigging to the next step. That environment is within an “Action” window. We are going to cover Action windows now because from this point forward we are going to be depending on its functionality as we learn more about rigging. If we don’t know how to use an Action window in A:M then we can’t rig effectively (or at all) in A:M.
So what is an Action window in A:M? An Action window is primarily an environment where you can interact with every aspect of a model within the context of creating a reusable animation with it. In order to reuse an Action or work on it later you’ll need to save your action. 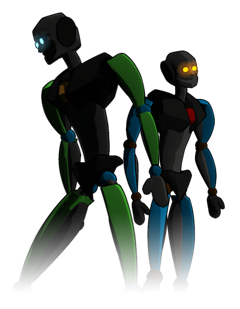 You can interact with the model’s rig if it has one and you can interact with the actual mesh of the model. Notice that I said interact with the model. You can’t manipulate a model’s geometry or bones and have the edits become a permanent part of the Model file from an Action window. You can, however, (and should) edit a model’s CP Weighting and Smart Skin data from within an Action window and the changes will be saved within the actual Model file itself. Editing CP Weighting and Smart Skin data in an Action window helps us to avoid making unintentional edits to other aspects of the Model. In addition to what I just mentioned, you can also use an Action window to try out different bone hierarchies that you arrange in the PWS or experiment with constraint set ups. That is what we’ll be using the Action window for in this tutorial. Since this is part of a rigging tutorial and not an animation tutorial, we are only going to learn how to use an action window to help us set up a rig. An Action folder thin the PWS. Let’s get started now by learning how to create a new Action window. You can create a new Action file by double clicking the Action folder. If you’ve been following along with me then you’ll only have one model file in the PWS and A:M will automatically create a new Action file for the model in the PWS. 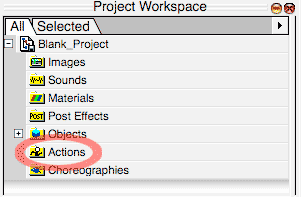 In the PWS, I have a new Action file now in the “Actions” folder and it references my model file that is in the “Objects” folder. Your screen should look similar to the image on the left. So now we have a new Action window and yours will look very similar to the Modeling window that we were working with earlier. Manipulating bones in each environment is very different. Keep in mind the that “Bones” mode in a Model window is for layout and placement of bones. Actions in A:M are also related to something in A:M called “Poses”. In A:M, a Pose is simply the name for an Action that is stored within the actual model file itself but there are important differences. This is all that we need to about Actions for now before we move on to the next step.